Please refer to our stock # 1127 when inquiring. These late 19th century Chinese Famille Verte ceramic bowls are 1 7/8” high and 5” in diameter. 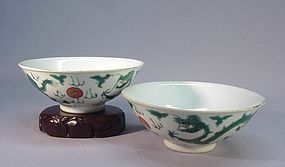 There are two green dragons chasing flame surrounded red globes on the outside the bowls. Inside the bowls, there is one globe with flames. There is an orange peach and lucky bat mark on the bottom of each bowl. Aside from some small hair line cracks due to their age and three tiny chips on one bowl due to the firing, they are in very good condition.